Chinese technology satellite.hinese technology satellite. 50 kg test satellite, built by university students, was to have been placed in a 300 km polar orbit. Status: Operational 2002. First Launch: 2002-09-15. Last Launch: 2003-09-16. Number: 2 . Gross mass: 50 kg (110 lb). Family: Technology, Technology satellite. Country: China. Launch Vehicles: DF-31, KT-1. Launch Sites: Taiyuan. Agency: KT, Tsinghua. Bibliography: 2, 552, 554, 12623. 2002 September 15 - . 10:30 GMT - . Launch Site: Taiyuan. LV Family: DF-31. Launch Vehicle: KT-1. FAILURE: Second stage failure.. Failed Stage: 2. HTSTL-1 - . Mass: 50 kg (110 lb). Nation: China. Manufacturer: Tsinghua. Class: Technology. Type: Navigation technology satellite. Spacecraft: HTSTL. First attempted launch of the all-solid-propellant KT-1 launch vehicle. The 50 kg test satellite, built by university students, was to have been placed in a 300 km polar orbit..
2003 September 16 - . Launch Site: Taiyuan. LV Family: DF-31. Launch Vehicle: KT-1. FAILURE: Fourth stage failed to ignite.. Failed Stage: 4. Kaituozhe 1 - . Payload: PS-2. Mass: 40 kg (88 lb). Nation: China. Spacecraft: HTSTL. Second attempted launch of KT-1. 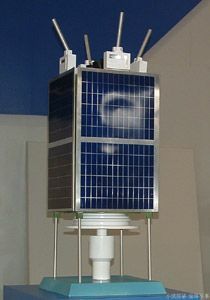 The launch was intended to place a 40 kg microsatellite called PS-2 into a 300 x 300 km polar orbit..